Dr. Kuo Liu Hsiu is originally from Taiwan. She has lived and studied in Germany and completed a Doctoral degree in Music in the U.S. She plays many instruments and her music has allowed her to perform all over the world, most memorably for Mikhail Gorbachev and the Queen of Jordan. Dr. Kuo also played at the 50th anniversary of the bombing of Hiroshima and the 50th anniversary of the founding of Israel, as well as a Middle East peace concert. She has played to accompany poetry, dance and films. Her experience includes touring and producing CD collections for commercial release. Most recently, Dr. Kuo was a visiting professor in China during the 2007 school year. While there she started the first music therapy concerts in southwest China to assist those with trauma from the 2008 earthquake. 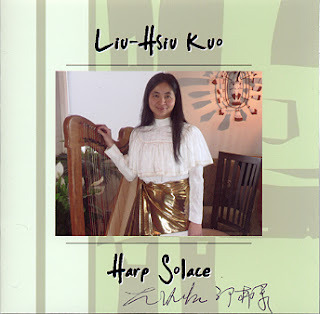 Dr. Kuo also played the harp during the 2011 awards ceremony of the Viktor Frankl Institute of Logotherapy (USA) where I first heard her perform live. Lui Hsiu is the originator of the The MusicMap, a project grounded in logotherapy and which seeks to discover meaning through music. The MusicMap™© project has two goals: the first is to help people know themselves better by recalling how music has affected them throughout their lives; the second is to help the public to be aware of their sound environment and the proper use of music for wellbeing.